The orders tab of Hyper includes all of the orders system activities and provides the user with all the necessary tools for the order process, from the first price offer to its production. The system presents all of the information regarding exist and previous orders and includes: creating a new Price Offer / Order, defining the orders rules and terms, Searching for orders, Choosing the orders items and Pricing the product and its parts, defining discounts and modifying the order status. The table in this tab displays the orders according to the selected display. Double click on an order will open the Order / Offer Form. The information fields at the bottom of presents additional information for the selected order record. Additional fields can be displayed according to the requirements and needs of the user. Pro-forma Invoice - This status is manually updated by the user, for a price offer that was approved by the client. Canceled while Negotiation - This status can be manually updated for the approved price offers. After updating this status, it can be modified back to the "Quotation" status. Canceled after Approval - This status is manually updated by the user, to cancel an approved price offer. Sent to Production - This status is manually updated, to send an approved order to production. Press the New Price Offer button, to open the new Order / Offer Form. The system admin can update mandatory fields, according to the organization's requirements, that will be filled in by the user before opening the new order / offer form, in order to make sure that these information fields will be filled in. 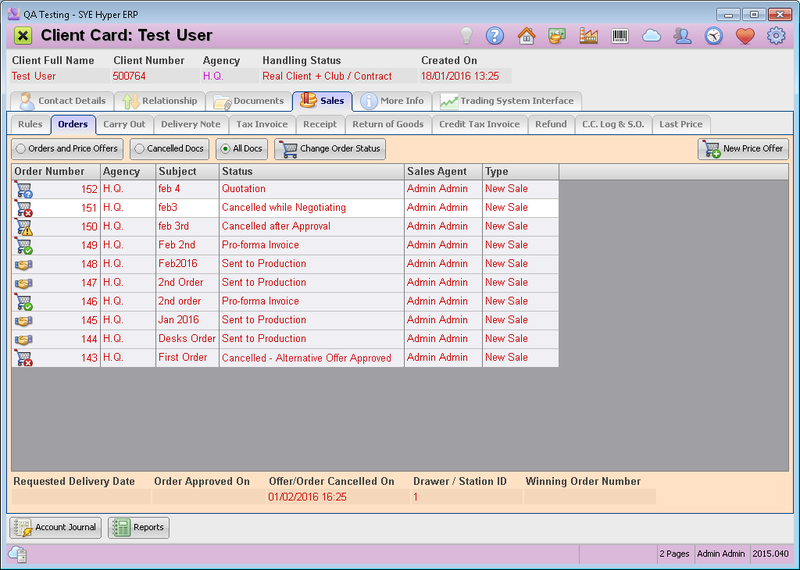 In order to define these fields, open the Orders tab of the System Fundamentals and select the required information fields from the list in the "Fields for ERP New Order pop-up window". 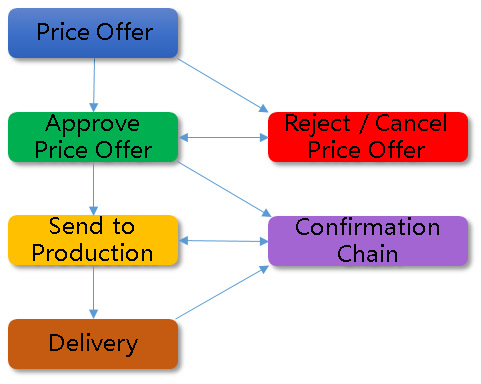 The "Order / Offer Form" is used to describe a deal between the organization and its clients. By using this form, the user can execute advanced processes and activities including the production chain, Production Planning & Control, bookkeeping, products pricing, create new related tasks, define payment conditions and terms, update discounts etc. The Change Order Status button opens the Change Order Status window. This window displays all of the details for the selected order and allows to update the order's status to proceed / modify / cancel it. Double click on selected order will open its Order / Offer Form. According to the current status of the order the user can modify the orders details and items, update the confirmation chain, edit the information for office use, manage and update the production process and follow every modification that was made in the selected order.